As organizations drive to transform and virtualize their IT infrastructures to reduce costs and manage risk, networking is pivotal to success. Optimizing network performance, availability, adaptability, security, and cost is essential to achieving the maximum benefit from your infrastructure. But what is needed to support these networking requirements? IBM® and Juniper® have entered into an agreement to provide expanded network technology choices with the new IBM Ethernet switches, routers, and appliances to provide an integrated end-to-end resiliency and security framework. Combined with the IBM vast data center design experience and with a field-proven operating system, Junos®, this portfolio, which we describe in this IBM Redbooks® publication, represents the ideal convergence of strength and intelligence. For organizations striving to transform and virtualize their IT infrastructure, such a combination can help you reduce costs, manage risks, and prepare for the future. 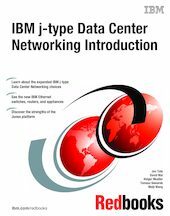 This book is intended for anyone who wants to learn more about IBM j-type Data Center Networking.